Bullying can have a devastating effect on young people. Kidscape’s vision is for all children to grow up in a world free from bullying. It provides children, families, carers and professionals with advice, training and practical tools to prevent bullying and help those affected reach their potential. 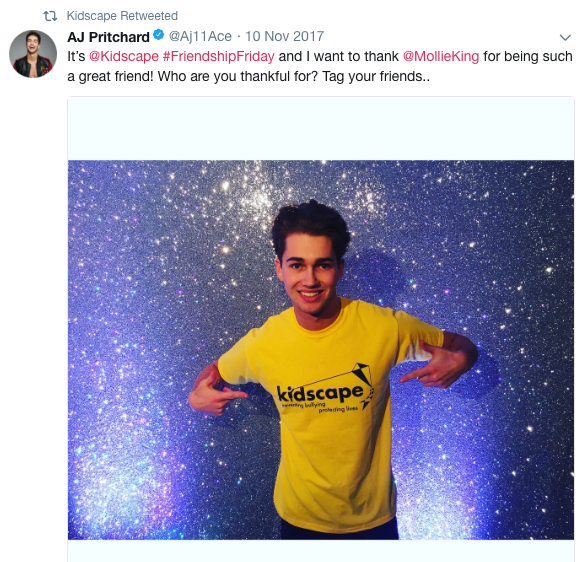 For the past two years, Kidscape has asked us to help raise awareness of their Friendship Friday campaign, which celebrates the importance of friends and asks everyone to extend the hand of friendship to new people, while raising funds for the charity’s work. In 2017 we developed a social media campaign to encourage Kidscape’s supporters to celebrate their friendships, and those of their children, by holding playdates on Friendship Friday, taking a selfie of themselves wearing yellow (the colour of friendship). We targeted regional newspapers and maximised reactive opportunities by placing a letter to the editor from CEO Lauren Seager-Smith in The Guardian. The theme of 2018’s Friendship Friday was Food for Friendship. We helped Kidscape promote the day on social media, engaging the support of chef Ken Hom and Saturday Kitchen presenter Matt Tebbutt. We worked to engage different faiths through religious media, encouraging people to share a meal together. And we supported Kidscape with some corporate awareness raising, sharing the positive message of the charity within sector publications. Celebrities including Strictly Come Dancing duo AJ Pritchard and Chloe Hewitt, actress Jill Halfpenny, and 60s icon Twiggy have got involved, tweeting their support.